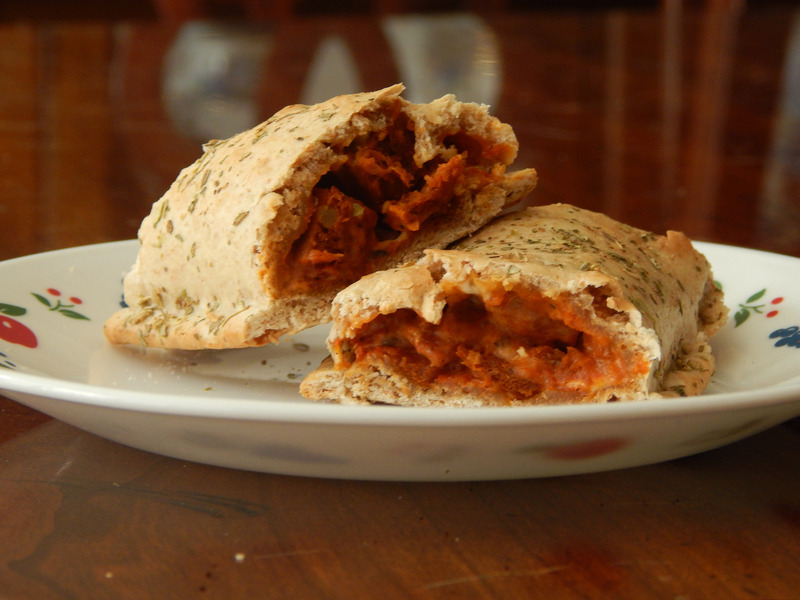 Tofurky has recently come out with a new line of vegan pocket sandwiches – including Turk’y Broccoli Cheddar Pockets, BBQ Chick’N Pockets, and these Pepperoni Pizza Pockets. Sometimes a picture is worth a thousand words. Look at the pizza pockets on the packaging – the gooey cheese, the thick, rich sauce oozing out of the crust. Definitely a two- or three-napkin pocket sandwich! Now, observe the sandwich in real life. What happened to all the ooey gooeyness? There wasn’t much in the pocket that resembled cheese. Worse, the pizza sauce was more like a thick paste, which made the sandwich a bit dry. Maybe more than a bit. Forget about two or three napkins – you’re in zero danger of dribbling the filling from these onto your shirt! However, there were some good points. I liked the whole wheat crust, which was sprinkled with Italian spices. The pizza paste – sorry, I can’t bring myself to call it “sauce” – was flavorful. And the thick chunks of pepperoni tasted and chewed very much like pepperoni. 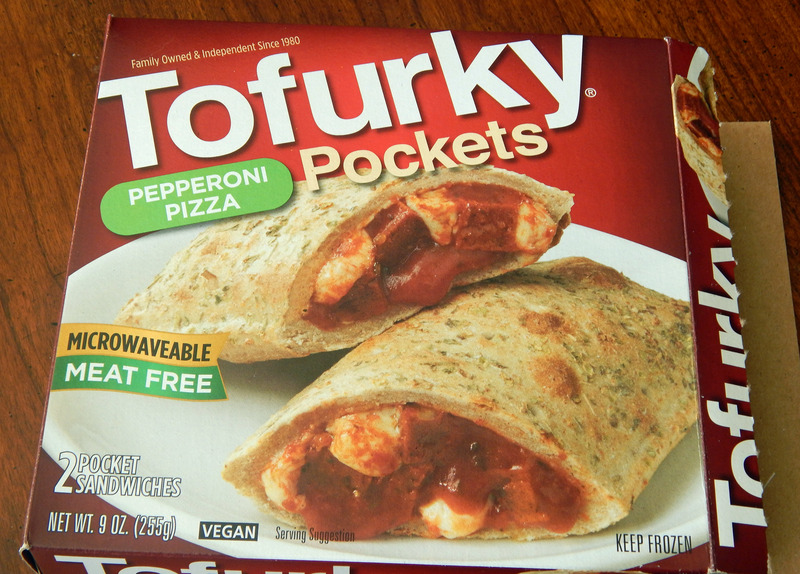 Out of curiosity, I decided to compare Tofurky Pepperoni Pizza Pockets with the non-vegan Hot Pockets Pepperoni Pizza. Calories: 300 for Tofurky, 320 for Hot Pockets. Nutritionally, the vegan version wins, with less calories, fat, cholesterol, sodium and more Vitamin C and iron, and almost as much protein! Verdict: If you’re a fan of Tofurky pepperoni slices or pocket sandwiches, give these a try. In Charlotte, NC you can find these at Earth Fare. I rarely eat meat substitutes – but it’s good to know what is out there when the cravings hit! those pictures on the box are so deceptive! I’m glad you had a better experience with these than I did! Unfortunately, I really don’t think I’m the exception … a number of my friends had similar experiences, and a few other bloggers did, too. Maybe it was a bad batch, or maybe they have learned from the initial reviews and reformulated their product? I certainly hope so, because the concept is wonderful! Aah, those are likely possibilities, as I’ve only recently tried them! Either way, I’m happy to have stumbled-upon your blog; I see so many recipes I’ll have to attempt soon! Well, thanks for sharing your alternate point of view … I may have to re-try this sometime in the future! Please let me know how you like my recipes – and, do you have a blog yourself I can check out?